Our multi-purpose 100W LED Modules are the most compact and inexpensive high power LED lights on the market. Simply plug in a battery or power supply to blast out 14,000 lumens of light. The integrated LED driver circuit supplies consistent current to the LED emitter for maximum brightness. We source the highest quality Bridgelux LED emitters for accurate color and maximum efficiency. Our LED Modules can be used alone, or together in a light bar array. 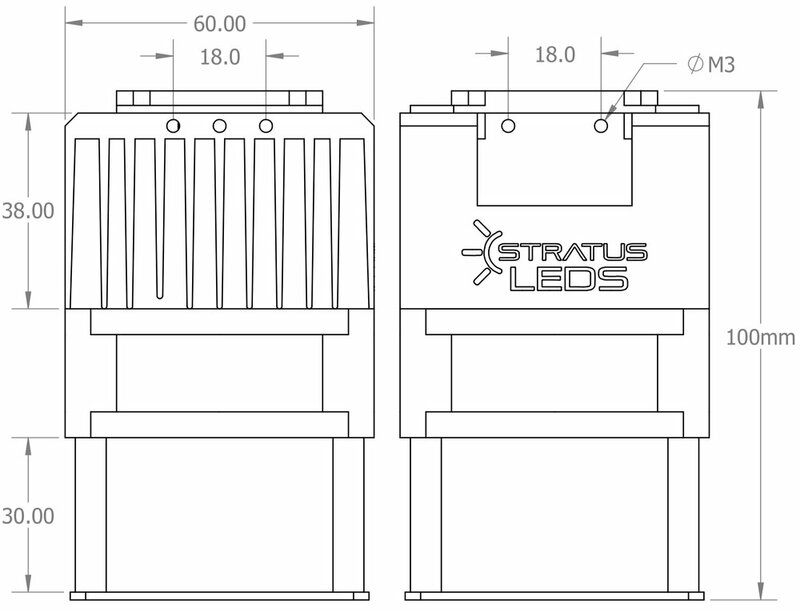 What makes our 100W LED Modules unique is their compact and light weight design. This is made possible by coupling aluminum heat sinks with high power cooling fans. Most 100W LED emitter systems use heavy heat sinks weighing over 1kg. Our efficient cooling system keeps temperatures down while weighing a mere 200g. All LED drivers are compatible with 11 to 27 volts DC. The voltage supplied to the cooling fans by the driver is equal to the main input voltage. The operating voltage range of a cooling fan is not as wide as the LED driver voltage range. For this reason, we give the option for either 12V or 24V fans. Using a 12V fan with 24V will burn out the cooling fan and prevent the LED from turning on. Using a 24V fan with 12V will cause the fan to spin too slowly and the LED emitter will overheat. Please select a cooling fan voltage option to match your preferred input voltage. We recommend using higher voltages whenever possible, especially when powering from batteries.